Our tremendous assortments of Export Boxes are used to transport the most valuable products safely even under extreme circumstances. 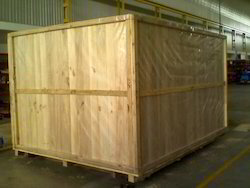 The range includes of the silver wood export boxes, heavy duty wooden boxes, wooden boxes, wooden crates and Euro pallets which are highly durable and efficient. We offer our wide range of Silverwood Export Boxes which are frequently used to package products that are exported. Our boxes are designed, created and processed to be ideal for packaging an assortment of hazardous or non-hazardous products and materials. We ensure that this material conforms to all international expectations of packing. 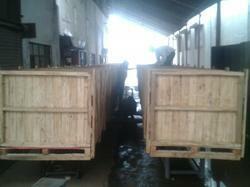 Our boxes are used in various industrial packaging services. 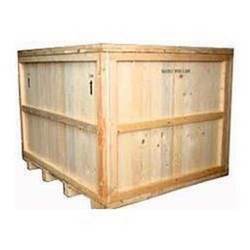 We offer our Export Pinewood Boxes which are made of deal/pine wood - a non coniferous wood in accordance with STD norms of packaging material. These industrial packaging boxes are basically used where goods are exported. They can carry the most valuable products safely even under extreme conditions. The pale yellowish white color is very pleasing and gives a smart appearance to products sent overseas. Hinges are of aluminum to allow easy opening. We are involved in manufacturing and supplying of Heavy Wooden Boxes which are used for transporting heavy machines, such as soot blower used in sugar industries, conveyors, etc. Looking for Export Boxes ?